After my post on Monday about “re-dimensioning” versus “designing” I’ve been trying to think of additional resources for anyone interested in learning more about different ways to achieve something similar. At this point I’m open to new ideas, but I’ve been having such good luck with what I’m doing (right or wrong) that I don’t see myself changing. Still, that’s no reason we can’t learn from others and try it out to see if it’s something we can incorporate into our own process. George is definitely someone who knows a lot about design and has some great insight into it, so I have no problem what-so-ever recommending the DVD to anyone who wants to learn more about the topic. If anything, the number one lesson I learned was about scaling and proportions. In fact, the more I think about it, that’s probably where I got the idea from originally and then just continued to build from it. 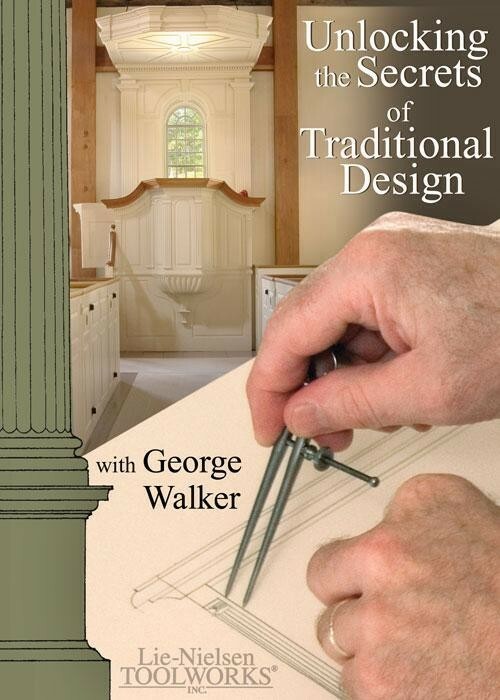 Checkout our original review of the DVD on “Review Show #11 – Unlocking the Secrets of Traditional Design.” Or if you’re convinced already it’s something you want to add to your DVD collection and design library pickup a copy at Shop Woodworking by clicking here. Don’t forget the book “By Hand & Eye” by Geo. Walker and Jim Tolpin from Lost Art Press. I haven’t purchased it, but I’ve read several of George’s columns in Pop Woodworking and they are great. Also, I believe the advice in design is to begin by copying examples of good design and continue doing that until you start to learn and understand what makes good design, why it looks good to the eye, and where it might not matter. Of course my personal opinion is that form should always follow function (which is why I gravitate towards A&C and Shaker styles) so I’m a pretty “plain and simple” type. Great feedback Mike, thanks for sharing the suggestions. Thank you Matt! I’ve been binging on the Wood Talk podcast and wandered to your site. I meant to say that I do like the re-design for Madison’s dresser. I like the look of Ikea stuff (quite a bit of it is very Shaker-esque) just not necessarily the quality. What you did with that is EXACTLY what I plan to do this spring for an entertainment center. « Do you “design” a piece or “re-dimension” it?